I attended Newham Sixth Form College (NewVIc) for 2 years from 2013-2015. In my time at NewVIc I studied on Entry level 2 Skills for Independence and Work. I feel that being at NewVIc enabled me to grow and learn and to meet new people. I was also involved in doing many new things and all my staff helped me and encouraged me to gain new skills and confidence and to pass my qualifications. I have always been very active, attending football sessions every Friday and going on trips and tournaments regularly. In my second year, I moved to Entry level 3 Preparation for Progression. 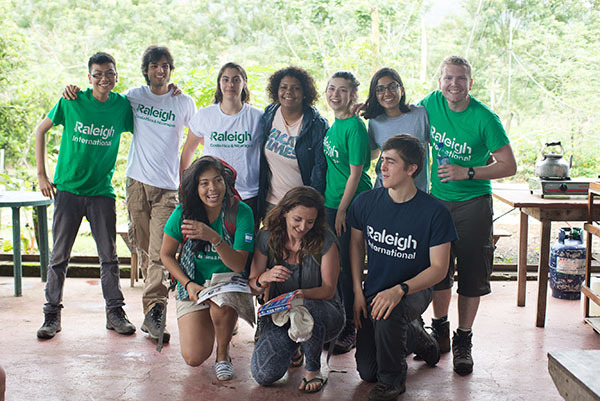 I went to a Raleigh presentation which offered me a great opportunity to visit amazing countries such as Costa Rica, Tanzania or Borneo. First I attended the Raleigh outdoor Adventure Residential trip. This was also an assessment and I passed. We took part in lots of team building and leadership activities and I made a lot of new friends. When we arrived in Costa Rica we were given skills training on how to navigate on treks, carrying lots of equipment, putting up tents and cooking outdoors and even first aid. In the first part of the expedition I was supporting a natural resource management project in La Cangreja National Park. We worked hard to complete trails around the park and it was tough as we had to complete our work early in the afternoon as it could be quite rainy in the afternoons. It was very tiring. The trails make the park easier to get around. The trails also need to be looked after to help stop forest fires, and plant and animal poaching. We learnt so much about the local way of life and were really welcomed by the local people – I also speak Spanish which helped. I also did a trek and this was tough but amazing; seeing volcanoes, wildlife and streams. I had the most amazing experience and was so pleased when I got awarded a golden mess-tin for my hard work! I learnt more about being independent and feel much more confident travelling around London and meeting new people. This was a great opportunity to learn about life in other countries and to do something to help in those countries. Going on the Raleigh changed me and also made a real difference to others. I hope I can be an inspiration for other students. Since I left NewVIc I am now studying childcare at the East Ham campus of Newham FE College. This entry was posted in Guest blogs, NewVIc and tagged Costa Rica, Newham Sixth Form College, NewVIc, NewVIc alumni, Raleigh International, Raymond Fernandez, volunteering. Bookmark the permalink.